HV underground and submarine cables: High voltage XLPE cables with copper or aluminium conductors are the most widely used cables in power networks. Cables used for electrical power running through the sea, it can carry high operating voltage and high current. 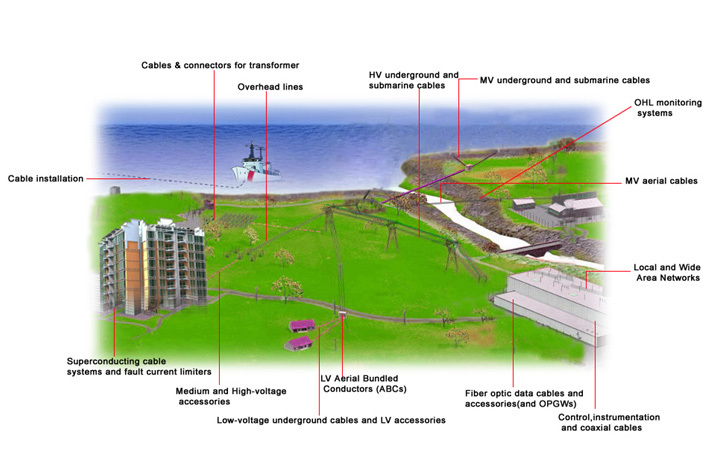 MV underground and submarine cables: Middle Voltage XLPE cables with copper or aluminium conductors are the most widely used cables in power networks. Cables used for electrical power running through the sea. MV aerial cables: MV covered or insulated cables are used in rural or suburban areas of the distribution networks. It is normally an application of middle voltage power line communication has abroad range and foreground. Superconducting cables systems: Cryogenic cables cooled by special materials allow more current to be transmitted. They composed of a ceramic-based superconducting wire that, when cooled to a very low temperature (-200°C [-328°F]), has very little impedance. Low-voltage underground cables and LV accessories: Uses for plant applications, and subscriber distribution. Accessories include LV cabinets and straight and branch joints. Fiber optic data cables and accessories (and OPGWs): Optical fibers are often used for data transmission, control and communications. It is able to perform the duties of a ground wire and also providing a patch for the transmission of voice, video or data signals. The fibers are protected from environmental conditions (lightning, short circuit, loading) to ensure reliability and longevity. Control, instrumentation and coaxial cables: Cable used for remote control, signaling, security systems, communications, intercom/P.A. systems and sound/audio etc.